In the 2014 inSpirit title, Marta I. Valentín reflects on the spiritual dimensions of her intersecting identities as a Latina, lesbian, feminist, God-praising Unitarian Universalist minister. With candor and insight, she probes what is universal in her own very particular history and what it means to strive for beloved community in the face of marginalization and cultural misunderstanding. like roots pointing toward the ground. and go about feeding the children of everywhere. the Holy Eucharist of the indigenous people. This time she will offer her healing touch. by Doña Leo and all her elders before her. preferring to act rather than speak. preferring to give rather than take away. but most importantly, the next generation. Rev. Marta Valentin invites us to witness Mardi Gras beads thrown as gifts for the chosen in New Orleans, to see the sacredness of yellow taxi cabs in dark nights, to bless the transitions of adolescence into adulthood, of life into death. These are words, prayers and meditations for Unitarian Universalism now—alive with bold images and offering an openhearted spirituality that acknowledges pain and hope, roots and possibility. 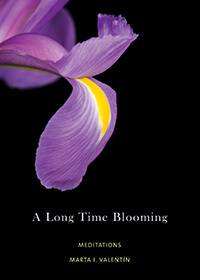 A Long Time Blooming is a rich blend of blends: multiple identities; English spiced with Spanish; reflection, poetry, prayer, litany; layers of metaphor doubling as straight talk. In this slim volume, a "Latina lesbian Unitarian Universalist minister" lifts up the paradoxes, ambiguities, and complexities of her insight and experience: making "my religion with the light and the dark" in order to be whole. She captures at once the limits placed on her freedom in these "un-United States" and her commitment to "account for every act of free will" she exercises. She remains deeply rooted in relationships, family, culture, history, and God while taking us to places as diverse as Venezuela, New York City, New Orleans, and Cuba. In describing the particularities of her own complex experience, she succeeds in helping us notice that as different as we sometimes are, "there is much about our lives as human beings that serves to connect us."